The JavaMail API provides a platform-independent and protocol-independent framework to build mail and messaging applications. It is an optional package (standard extension) for reading, composing, and sending electronic messages. JavaMail provides elements that are used to construct an interface to a messaging system. JavaMail includes several classes that implement RFC822 and MIME Internet messaging standards. These classes are delivered as part of the JavaMail class package. SMTP Acronym for Simple Mail Transfer Protocol. It provides a mechanism to deliver email. POP Acronym for Post Office Protocol. POP is the mechanism most people on the Internet use to get their mail. It defines support for a single mailbox for each user. RFC 1939 defines this protocol. IMAP Acronym for Internet Message Access Protocol. It is an advanced protocol for receiving messages. It provides support for multiple mailbox for each user, in addition to, mailbox can be shared by multiple users. It is defined in RFC 2060. MIME Acronym for Multipurpose Internet Mail Extensions. . It is not a mail transfer protocol. Instead, it defines the content of what is transferred: the format of the messages, attachments, and so on. There are many different documents that take effect here: RFC 822, RFC 2045, RFC 2046, and RFC 2047. As a user of the JavaMail API, you usually don't need to worry about these formats. However, these formats do exist and are used by your programs. NNTP and Others There are many protocols that are provided by third-party providers. Some of them are Network News Transfer Protocol (NNTP), Secure Multipurpose Internet Mail Extensions (S/MIME) etc. 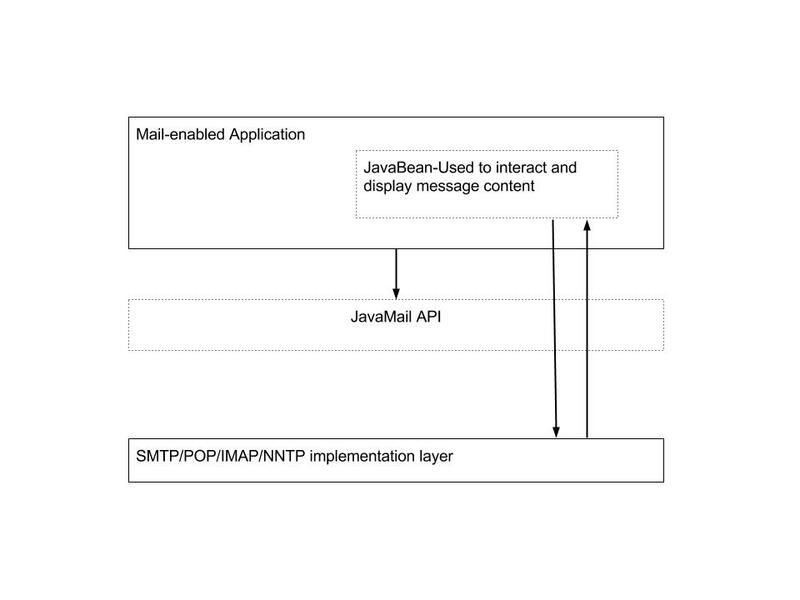 As can be seen in the above diagram, a JavaBean is used to interact with you mail box through JavaMail API. Protocols like SMTP/POP/IMAP help to achieve this. As these protocols have implementation to access the mailbox and JavaMail API acts as interface between user and mailbox. You can download latest version of from Java's standard website. You would also need JAF- Java Activation Framework. You can download latest version of from Java's standard website. Download and decompress these files. Now add mail.jar and activation.jar files in your CLASSPATH. activation.jar contains classes for Java Activation Framework. These classes are required for JavaMail API to run. Once you have a Message to read, you can get its content with getContent() or write its content to a stream with writeTo(). The getContent() method only gets the message content, while writeTo() output includes headers. Once done close Folder and Store. The boolean passed to the close() method of folder states whether or not to update the folder by removing deleted messages. Create a default MimeMessage object and set From, To, Subject in the message. Send the message using the Transport object. Create pop3 Store object and connect with pop server. Create folder object. Open the appropriate folder in your mailbox. Close the Store and Folder objects. Get the Session object with POP and SMPT server details in the properties. Create POP3 store object and connect to the store. Create Folder object and open the appropriate folder in your mailbox in READ_WRITE mode. Retrieves messages from inbox folder. Iterate through the messages, delete the message by invoking the method setFlag(Flags.Flag.DELETED, true) on the Message object. The messages marked DELETED are not actually deleted, until we call the expunge() method on the Folder object, or close the folder with expunge set to true. In this article we saw an overview of the JavaMail API. Steps to be followed to send,retrieve and delete email messages. Hope you liked the article.